Now more than ever, kids have become distracted by technology that keeps them indoors. To fight this trend, we’ve got to get creative. Here are 9 ways to get your kids playing outside more. While technology can be a fantastic addition to our lives, kids seem to be ditching the great outdoors for strictly indoor activities. According to one report in The Guardian, today’s kids spend only half as much time outside as their parents did at their age. 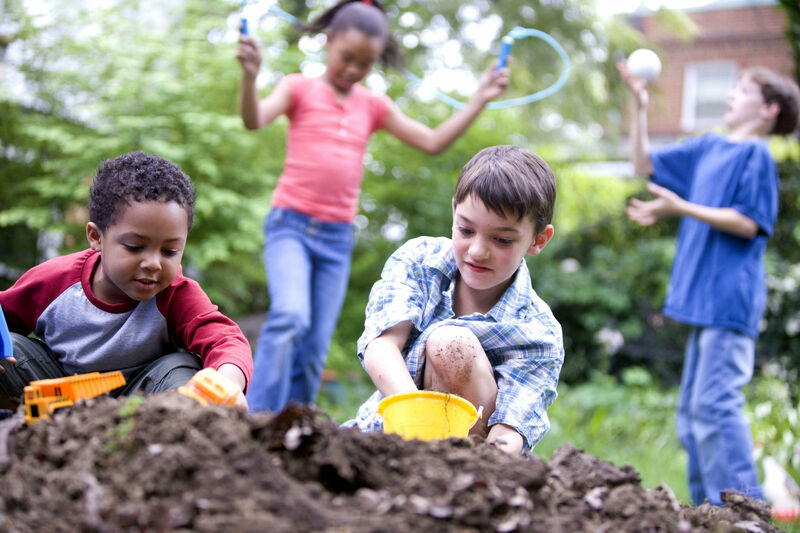 Here are nine tips to help you get your kids playing outside more often. As a parent, it’s important to limit your child’s screen time, especially if they’re younger. Temporarily taking away their tech is a tough but necessary step sometimes. If your kids won’t put down the games, it may be time to step in. A lot of the time, our kids just want to do what we do. So escape from the stressors of work and bills and have some outdoor fun with your kids. Save an imaginary kingdom, toss a ball, or explore the animal kingdom with your kids. You’ll have a great time and get to spend some quality time with your children at the same time. There’s nothing wrong with bringing the fun of indoor activities outside. Snag a coloring book or some sketch paper and create a portrait of your home with your kids. One of the best ways to get kids playing outside more often is by fostering a love of nature early on. Show them the wonders of the natural world from an early age and you’re more likely to have a child that loves exploring nature. It’s no secret that today’s kids (and adults, for that matter) don’t get enough exercise. Hiking can be a great way to explore your local state parks while tuckering your kids out at the same time. Playing outside is more fun when you bring friends along! Arrange a play date with your kids’ friends and let them loose in the backyard. Building a fun, kid-friendly environment in your backyard will make your children forget all about the indoors. Consider buying and building a small swing set or playground for your kids or grab a trampoline for kids. After all, few things are as fun as bouncing on a trampoline. Finding something to “do” outside is a little counter-productive, especially to kids. Unstructured play is one of the most important components of childhood. Give your kids at least a half hour per day of unstructured outdoors time. Let them climb trees, dig in the dirt, or just run around on the grass. Structure isn’t important, but play is. Here’s something useful and fun! Head to your local nursery with your kids and pick up some veggies, herbs, or flowers. Then spend an afternoon planting your kids and learn about each plant together. Kids playing outside may not be as common as it once was, but there’s no shortage of fun activities that your kids can enjoy. And some of them you can even join in on! For more great lifestyle tips for you and your children, be sure to follow our lifestyle blog!